Last year’s top performing Asian stock market in local currency terms won’t move the needle for investors in 2019, UBS Securities India Pvt. says. In fact, the benchmark may drop around 9 percent from current levels, according to the brokerage. “While GDP growth may recover a bit, political and policy uncertainty keeps us cautious,” Chhaochharia said in the report. The index recently traded at 10,900 in Mumbai. 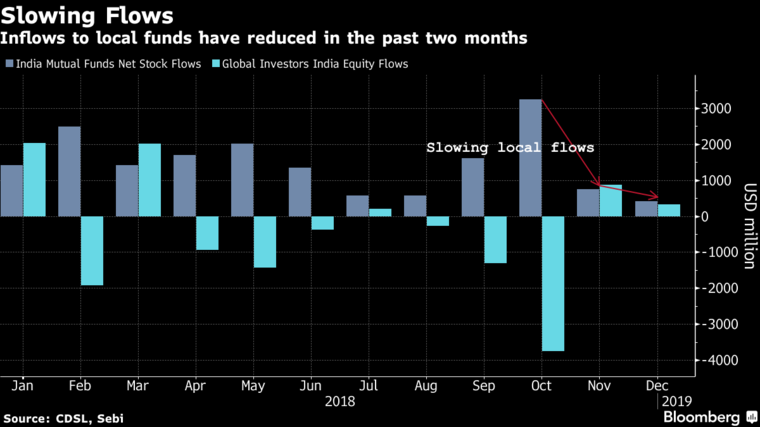 Indian equity-market valuations have remained relatively high over the past four years even as estimates for the magnitude of earnings growth have been cut, the analyst said, attributing the stability to government policy changes. The outlook, however, is changing.